Combination hydro-mechanical Parking Brake calipers use hydraulic pressure from the master cylinder for stopping power, and an internal mechanical lock within the caliper for a parking brake. CPB kits are built primarily for front wheel drive vehicles, and select rear wheel drive axles that are not well suited for internal shoe style parking brakes. The calipers are coupled with oversized two-piece rotor assemblies with aluminum hats and high friction BP-10 compound pads. 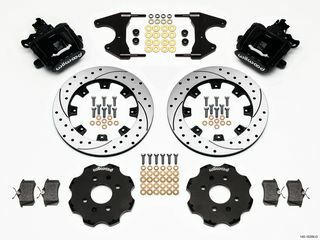 CPB kits provide the correct balanced brake performance and matching style to compliment front big brake upgrade kits.